This is going to go down a treat. Kibbeling and frites is a very popular snack in Holland. Sold from a variety of establishments…. from kiosks on seafront promenades and seafood stalls in the local market to michelin starred restaurants ….it is typically Dutch, like pragmatism for example. Kibbeling is a corruption of the word “kabeljauwwang”, which means ‘cod’s cheek, it consists of deep fried chunks of fresh cod accompanied by a choice of dips… generally versions of tartar, garlic or mayonnaise. 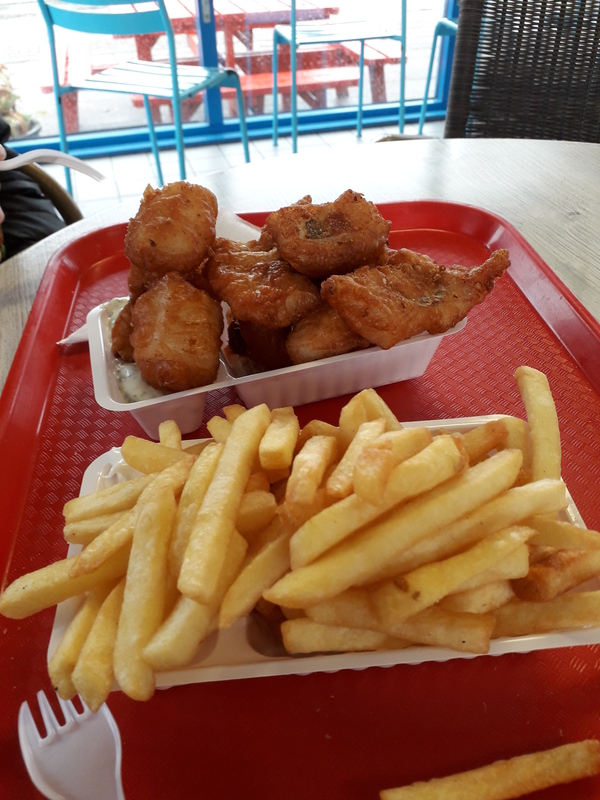 Nowadays, some vendors may use offcuts of other white fish like hake, pollock, haddock or whiting to construct their version of kibbeling, which will naturally have an affect on the flavour as will the batter. The best kibbeling is 100% cod. So, where are you going to encounter the best kibbeling? This is where my selfless quest begins. Take the ferry from Harwich to the Hook of Holland. Disembark the ferry, (preferably by bike…you won’t regret it), pass through customs and passport control, you will be confronted by a kiosk called The Hoekse Vishandel.